One year after the Belgian premiere of the movie held during the Cinevox Happening special Magritte, Tous les chats sont gris by Savina Dellicour won two Magritte at this 6th Magritte Awards which took place in Bussels on Saturday 6 February. 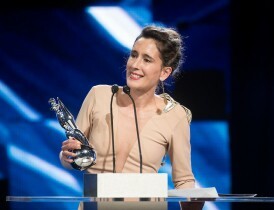 Savina Dellicour received a Magritte for Best First Film and Anne Coesens received an award for Best Actress in a Supporting Role. Congratulation to both of them and to the whole crew! If you missed the ceremony, see you on Wednesday 10 February at 9:10pm on the 3rd channel (RTBF) to discover the summary of this wonderful event. We invite you as well on Saturday 26 February to the César Awards Ceremony where Ni le ciel ni la Terre is nominated for the Best First Film award.